ProMo-Cymru has won the Best Marketing Communication Award at the Wales Online Digital Awards with a campaign developed for the Meic helpline. Sarah McCreadie, a 25-year-old spoken word artist, created and performed a special poem about relationships. ProMo-Cymru translated the poem, Mari Luz Gil-Cervantes recorded the Welsh vocals, and their creative team produced a video. The campaign ran on the Meic website, their YouTube channel, all social media channels and on the Hwb platform for schools. 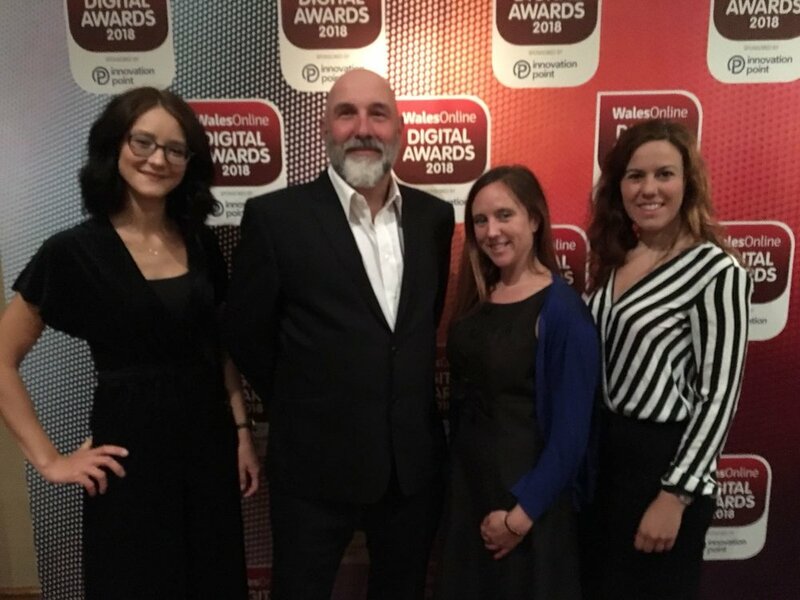 The Wales Online Digital Awards was held at the Cardiff Marriott Hotel on 8th June. Four of the ProMo-Cymru team attended the awards: Marco Gil-Cervantes, Chief Executive; Arielle Tye, Business and Funding Manager; Dayana Del Puerto, Multimedia Producer and Director; and Augusté Poškaité, Graphic Designer. “The talent and experience in the room was exceptional. There was a mixture of digital startups and well established, thriving digital businesses,” shares Arielle. Chief Executive Marco added how important working with young people was on this campaign. “For over 20 years our focus has been on co-producing successful digital communication solutions,” he explains. Following the relationship campaign Meic ran a mental health campaign during Mental Health Awareness Week in May. Check out all the articles here on Meic. The next Meic campaign will be on sexual health during Sexual Health Week in September. Keep an eye out for their materials going out during the week of 24 September.